This page is about the making of and thinking about a Blanket for the Earth.To start, yes I would love in one respect to be able to create a comfort blanket to wrap this wounded earth in, to make it feel cared for and loved and reassured , something I feel is so desperately need, compassion for the planet, we are living on, which provides us with food and shelter and nourishes us with all its wonders. As I am beginning to understand that the idea of separateness belongs to a model of thinking with slow but surely becomes outdated as Quantum Physics begins to prove the notion of interconnectedness which have been known by so called primitive cultures such as the First Nations, I also understand that I am part of everything and everything is part of me. I am very much at the beginning of getting a grasp of this vast idea of interconnectedness. Based on this notion I am aiming to create a piece of woollen fabric, created in the round, as a lot of vital things are round, the earth, the sun, the moon, my favourite apple, you get the idea and this round piece will have the diameter of my wingspan (which I still have to measure). The material is hand spun wool (spun by me); the material will be a mix of wool, like the carding waste from the Natural Fibre Company in Launceston, a small mill which only processes British wool and local wool from Cornwall, gathered from local businesses and friends. 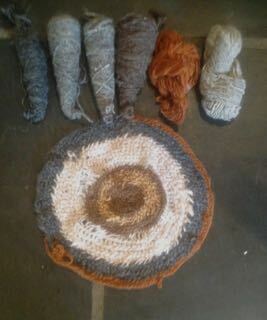 The posts will document this process from raw wool to a yarn, washing, sorting, carding, spinning. From a hand spun cob (that is the wool on a spindle in its cone shape) the process continue through washing the skeins (that is when the yarn is wound on an Niddynoddy (I have not invented this name, it is an old tool for making skeins) and dying with natural dyes. It has been a long process and a steep learning curve, learning to spin with a range of spindle until I found the one which works best for me, Turkish Spindle, realising that with a single spun yarn I can not spin straight and needed to learn how to ply. Plying brings at least two strands together to create a balanced yarn: spin goes clockwise, plying goes anti-clockwise, the result is yarn which does not curl! 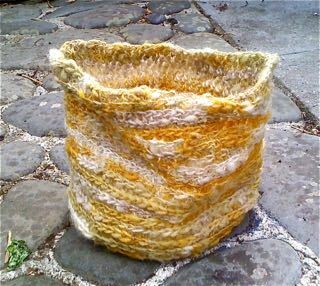 The knitting of the piece took about three month, I was glad that is was a cool summer! At the end it measured 3 ft by 7 ft! 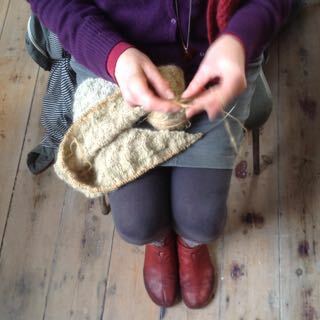 When I was knitting in public people started to remark, that it looked like Sky to Sea to Earth. Only through the process, I realised the inherent narrative . I had started with the natural white wool, followed by the pale blue of the exhausted dye vat, various blue shades, a range of greys and ending in a deep dark brown. I do not mind. I like a story. The shape went through a range of explorations, first had imagined a round piece in Nalebinding. I gave up on this idea as I realised that my yarn was too thin and the continuous counting would stay in the way of a relaxed working, which is an important aspect in my work. Also nalebinding is a very slow process, with the need of connecting a new thread with the previously one, instead of working with a continuous thread. it’s the reason why knitting took over as a techniques and nalebinding got almost lost. For the similar reasons I canceled Crochet in the round out. Next was the idea of a triangular shape, based on my practise of knitting triangular shawls as my meditation pieces and travel companion. 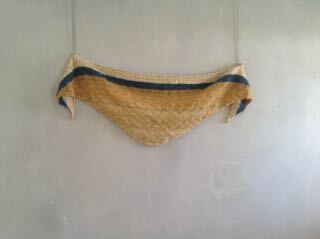 I knitted a small yellow shawl with yarn which had been dyed with onion skins, weld (yellow) and I added a small amount of woad (blue) dyed yarn. This trial piece showed me, that for the size of a final project I had in mind, I would run into technical problems as the base of the triangle (the line on the top) would be come too long for normally available circular knitting needles. The Pieces is finished now, hung in the exhibition space. I miss it, its weight on my hands, the warmth over my knees, the feel of the different textures of the yarn. Attachment. It has been my companion in my imagination for over a year and on the hands for a good three month, with daily engagement. It has been a long, some times trying but very rewarding journey.